Bogić Risimović Risim was born in Čačak in 1926 in a dyer’s family where, from the beginning of his life, he was surrounded with colors for whose smell and expression he was searching all his life. He graduated from the Academy of Fine Arts in Belgrade. Рисим’s formation as an artist belongs to the period of the ’50s when in Serbian painting, after a short period of socrealism, gradually developed certain forms of post-war modernism. In the course of 35 years of creative work, he experienced a complex and whole path of development. He started with paintings of homesickness, stylized lines and a simple expression of road monuments and later through the paintings of poetic and magic realism he reached a universal image of a pure poetic experience and a complex contemplative message (Alchemist, 1973, The Paradise, 1976, Čačak Isn’t What It Used to Be, 1981, Holiday Feast, 1983, The Street, 1983). He was successful as a film designer and an illustrator in daly newspapers, magazines and books, wrote poetry and texts on art. He was lived in Sarajevo and than became a professor of drawing at the Academy of Applied Arts in Belgrade. He had numerous one-man and group exhibitions in the country and abroad and he was a winner of many important awards. He died in Belgrade in 1986. This Memory-collection was founded in 1992, a few years after painter’s family had donated the Municipality of Čačak 40 paintings, hundreds of drawings, sketches, illustrations and archival material For the need of keeping and exhibiting this collection, the local Municipality was reconstructed the old house at 11 Gospodar Jovanova Street. 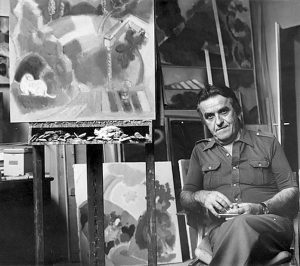 Risim’s painting and his whole creative work represents a recognizable stylistic and art whole of an authentic expression, which he, though often remoted from current art happenings, consistently developed and it was the reason why today he represents an important phenomenon among the representatives of national values of Serbian art in the second half of the 20th century.